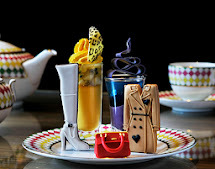 In celebration of the 150th Anniversary of the world’s first underground train system, The Park Lane Hotel, The Palm Court has created a very special London Underground Afternoon Tea. Available till the 11th March, the London Underground Afternoon Tea will take you on a culinary journey around the world-famous tube network. Honey Roast Ham (for Paddington Bear! ), Toasted Muffin, ‘Piccadilly’ Relish and Micro Cress. Tea will be served with a Metropolitan 1863 cocktail, a blend of Beefeater 24 gin and blackcurrant tea. London Undeground Afternoon Tea is priced at £41 per person and advance booking on +44 (0)20 7290 7328 is required.